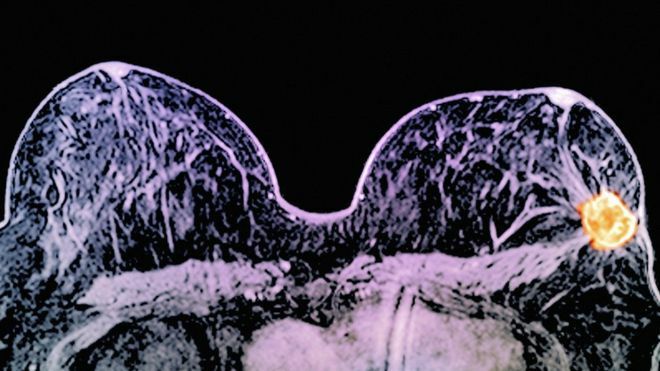 In the news today was an announcement about yet another promising cancer treatment, which may benefit 5% of breast cancer patients. In a small trial involving HER2 positive breast cancer patients (around 20% of breast cancers are HER2 positive), 66 patients were given a combination of two cancer drugs – Tyverb and Herceptin (known generically as lapatanib and trastuzumab). Around 25% of them saw their tumours rapidly shrink with some having no signs of any disease after just 11 days. This is great news and very encouraging but it important to note that it is far to early to tell whether these results can be replicated and if the drugs remain effective over the longer term. However, perhaps even more important is whether the NHS will even be able to afford the drugs if they come to market. One of the drugs, lapatinib, has already been rejected by NICE, the organisation that determines whether or not a drug is affordable for the NHS, due to its price tag of £24,000 per patient per year. Even more sad, is that we already have another treatment for HER2 positive breast cancer called Kadcylca, which can add 6 months to patients’ lives but again was rejected as unaffordable due to the whopping price tag set by its owner Roche, the biggest supplier of cancer drugs in the world, of £90,000 per patient per year! The drug companies agrue that they need to charge these sorts of prices to recoup R&D costs, but a recent investigation by the Washington Post has found that this is blatantly untrue. 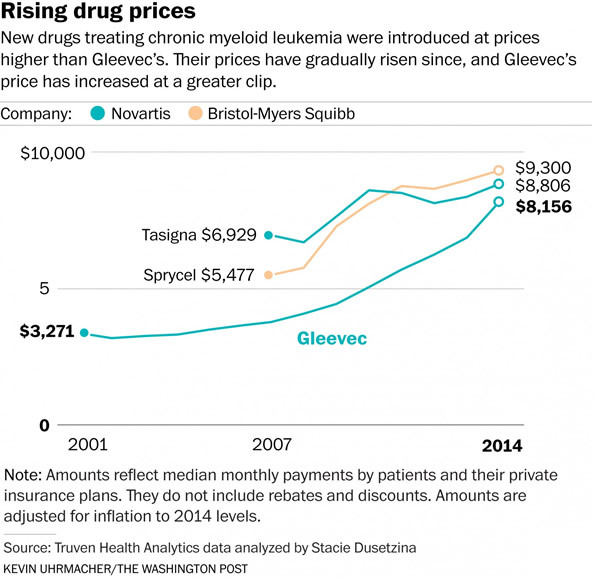 The investigation looked into the costs of the leukemia drug Gleevec, known in the UK as Glivec. When its owner Novartis brought the drug to market in 2001, its price tag was $26,400 (£18,200) per patient per year. At the time the drug company said that this high price was necessary to recover R&D costs, which it was aiming to recover over a two year period. But now the price tag has soared to over $120,000 (£83,000), despite far greater numbers of patients receiving the drug than originally anticipated, despite the fact that R&D costs have now been recovered and despite the fact that the cost of manufacturing a year’s supply of Gleevec is estimated at only $143 (£99). This scale of open profiteering beggars belief given that one person is dying of cancer every four seconds. There are currently no regulations to prevent drug companies charging what they like for cancer drugs under patent protection and they are clearly abusing their dominant market positions to extract unreasonable profits at the expense of patients lives. The Dying for a Cure campaign is calling for the UK Government to reform the whole system for developing cancer drugs to tackle issues like this and is recommending that the Government introduce new regulations to ensure that prices of drugs under patent protection reflect the true costs. Please help us persuade the UK Government to tackle this scandalous profiteering and make more life saving drugs accessible to patients by supporting our campaign and signing our petition. No Replies to "Cancer Drugs Priced Out of Reach"